Wow what a trail! If you like to backcountry ski, and you like hills, the Raymond Brook Ski Trail is for you. 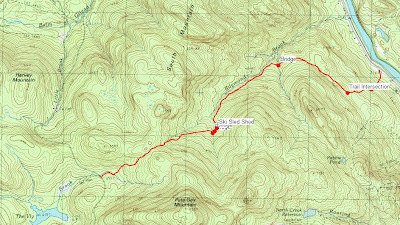 Adjacent to Gore Mountain lies a local secret... a 4.2 mile long backcountry ski trail that takes you on a 1375' vertical drop over the length of the trail. And you don't have to earn your turns! You will need two cars, or to spot your car at the finish and catch a ride to the top. The top is a trailhead on Barton Mines Road (off Route 28 in North River, NY). It is a signed trailhead with a parking area and a sign-in kiosk. The trail lies just north of the the parking lot and head east. It threads South Mountain and Pete Gay mountain while climbing 200 feet over the first .7 miles before dropping down into the Raymond Brook drainage. This is where the fun begins. Go there on a fresh powder day and make some fine tracks through a quiet wilderness. 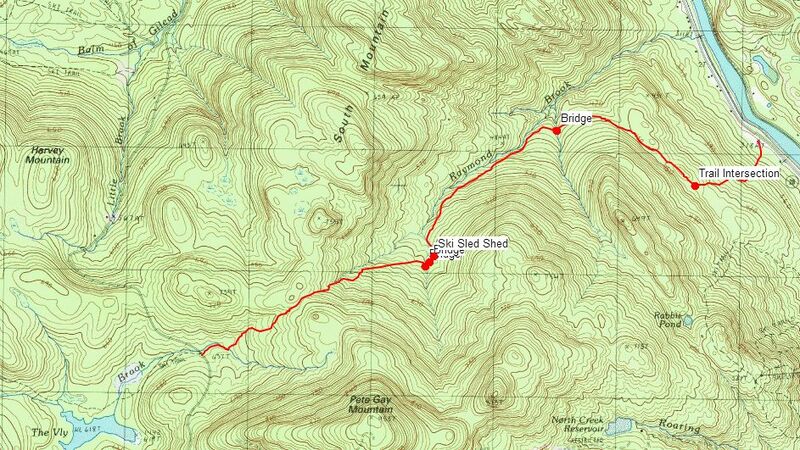 Evidence of the old route is found in a 1930's rescue sled shed still standing along the trail! Shortly after the old shed the trail levels off as it hooks in a southeasterly direction. Later you come to a trail intersection where you can drop down a steep finish to Route 28, or continue along a flatter route to the North Creek Ski Bowl (depending on where you spotted your car). I skied the route today (New Year's Day), 4 days after two storms dropped about 18 inches of snow. The trail had already been broken of course, but there was plenty of fine snow to make some tracks. I skied down the route at a leisurely pace since the route was new to me and I wanted to take some pictures. At my pace, it took me just over an hour to reach the Route 28 finish location. I'll be back to ski this route again. Maybe I'll try the connector to the Ski Bowl. A map of the route. Barton Mines Road is on the left, Route 28 is on the right. Awesome! So psyched you tried this! Raymond Brook is at the top of my must-ski list. Wanna go back?